Will Kohl’s Deliver Improved Profitability in Fiscal 2019? Amazon (NASDAQ:AMZN)has taken another huge step towards becoming an omnichannel retailer. 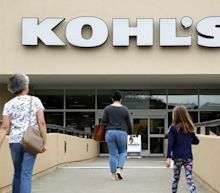 The Seattle-based firm has expanded its alliance with Kohl's (NYSE:KSS).Source: Shutterstock Under the terms of the deal, customers may return the items they purchased on Amazon at all Kohl's stores. Previously, the service was only available at 100 Kohl's stores. * 10 Stocks to Sell Before They Give Back 2019 Gains Although the impact of the deal on Amazon stock remains unknown, the move makes buying producvts on Amazon more like making in-store purchases. It also could eventually enable Amazon to greatly expand its physical-store footprint.InvestorPlace - Stock Market News, Stock Advice & Trading Tips Returns at Kohl's Could Lead to Something BiggerKohl's already sells some items from Amazon in about 200 of its stores. Moreover, some Kohl's stores have an Amazon Smart Home Experience, which places the Alexa smart-speaker ecosystem on display. Now, with all Kohl's stores accepting Amazon returns, Amazon will be able to provide more personalized service to its customers. Consumers tend to feel dissatisfaction with a company when they return items, so adding a personal touch when returns are made can help a company avoid losing customers.However, I think the announcement speaks to a goal that's more directly critical to both AMZN and Amazon stock. Last year, Amazon launched Prime Wardrobe, a "try before you buy" clothing service. The service meets the needs of customers who want to feel and try on clothes before buying them. It also helps AMZN compete with firms such as Stitch Fix (NASDAQ:SFIX). Stitch Fix, another "try before you buy" outfit, uses artificial intelligence (AI) to determine individuals' clothing preferences.Still, some still might feel more comfortable buying clothes at a physical store. Consequently, an expanded alliance between AMZN and KSS or an outright buyout of Kohl's by Amazon would be a logical step for Amazon. Such a step would bring Amazon's Echo, returns, and clothing sales to over 1,100 stores across 49 states. It would also make Amazon a true omnichannel retailer in more areas. Furthermore, since consumers consider both Amazon and Kohl's "discounters," such a merger would likely be a better fit for Amazon than its acquisition of Whole Foods has been. Retail Profits Don't Affect Amazon Stock MuchHowever, the Whole Foods deal should lead investors to question the extent to which a merger with KSS will help Amazon stock. The single-digit revenue growth of Whole Foods falls short of the growth of other parts of AMZN. Likewise, the owners of Amazon stock would have to realize that an acquisition of Kohl's would further slow Amazon's revenue increases.Moreover, despite the massive revenues that AMZN obtains from its retail business, the company earns most of its profit from its cloud business, Amazon Web Services (AWS). As a result, I do not see how any additional deals with Kohl's will help Amazon stock. Concluding Thoughts on Amazon StockAmazon's decision to accept returns at more Kohl's stores will make consumers view Amazon as more of an omnichannel retailer. The deal will also enable AMZN to provide an increased level of personal service to its customers. By buying KSS, AMZN would boost Prime Wardrobe and become one of the larger clothing retailers.However, for all of the buzz and revenue such moves generate, yesterday's deal increases the attractiveness of KSS stock more than AMZN stock. An acquisition of Kohl's by AMZN will likely not produce the massive profit increases which is important for the owners of of Amazon stock. AWS affects AMZN's profits much more than its retail business, and that will remain the case, no matter what happens between Amazon and Kohl's.Prime shoppers have a lot to smile about in the wake of the deepening alliance between AMZN and Kohl's. Prime Wardrobe customers and the owners of KSS stock may have more reasons to rejoice in the future. However, for the holders of Amazon stock, this deal should elicit little more than a yawn.As of this writing, Will Healy did not hold a position in any of the aforementioned stocks. You can follow Will on Twitter at @HealyWriting. More From InvestorPlace * 2 Toxic Pot Stocks You Should Avoid * 10 Oversold Stocks to Run From * 7 Red-Hot E-Commerce Stocks to Consider * 4 Stocks Surging on Earnings Surprises Compare Brokers The post The New Kohl's Deal Probably Won't Affect Amazon Stock Significantly appeared first on InvestorPlace. Kohl’s will be accepting Amazon returns in all of its stores across the country, starting this July. As of today, only 100 Kohl's stores have this option. Yahoo Finance's Jen Rogers, Myles Udland, Brian Sozzi and Brian Cheung discuss.